Research has shown that about 80% of people will experience back pain at some stage in their life. Therefore, spinal pain is by far one of the greatest causes of lost work time to injury and pain. Having said this, spinal pain can be avoidable with some strategies, specific back exercises and lifestyle modifications. You might be asking well what does cause my back pain? Well that is the million-dollar question. The literature has shown over the past few years that back pain is most certainly a multi factorial presentation That is, it is not just influenced by a mechanical injury. Back pain is influenced by a person's work life, attitudes and beliefs towards back pain, things going on at home, emotions, past experiences and perceived knowledge of the state of their back as well as the mechanical side of things including tight muscles, stiff joints and poor control of the spine. Did you know that medical imaging of your spine is not always indicated? For example, studies have shown on MRI that 37% of 20 year olds, 80% of 50 year olds and 96% of 80 year olds have some degree of spinal degeneration. Sometimes the results on these scans can be misleading and just a part of the normal aging process. This demonstrates the importance of a good quality clinical assessment based on your individual situation. We do not shy away from the fact that the brain plays a huge part in every pain presentation, not just spinal pain. These psychosocial factors are sometimes difficult to determine therefore our therapists regularly take part in additional professional development to ensure they are ready to handle the curliest of presentations! 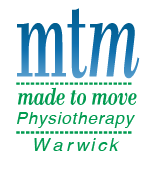 The team at MTM Physiotherapy Warwick are well trained in the assessment and management of back pain, whether that is neck, mid back or lower back. We will assess your individual situation and in discussion with you we will formulate a management plan to ensure recovery for you. There are many ways to improve the health of your spine and Physiotherapists are thoroughly trained in the biomechanics and physiology of the spine. We can apply manual therapy treatments, exercise programs, postural advice, strength programs and ergonomic advice to better prepare you for the challenges of our modern life. The team at MTM Physio Warwick do believe strongly in movement so be prepared to exercise! As part of our multi factorial approach to rehab, not only do we offer exceptional hands on treatment but also Pilates classes. These pilates classes are run by a Physiotherapist and are predominantly fit ball and mat based sessions. By keeping it simple, you are able to take home some of the skills learnt in these classes to achieve a long term healthy spine! If you suffer from back pain, why not give one of our friendly and knowledgeable Physiotherapists a call today.